When Jill Stuart released 08 Dazzling Moon in the Illuminance Eyes range, I wasn't totally ready to take the dive. Eyeshadow palettes from Jill Stuart are usually in shades of pinks, so anything not pink piques my interest. 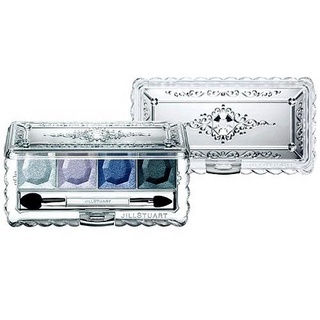 I did however have a blue/aqua palette from the first eye shadow palette series that I bought because it was blue, but then actually didn't love the colours enough to wear ¬_¬ So when Dazzling Moon came out I wasn't sure if it was a blue palette or a purple palette. I finally made the plunge and I'd say it's a purple-blue palette. I'm really glad I went for this palette. The colours are just lovely and tonnes of sparkle, which I love. Another wonderful product from Jill Stuart. How is everyone's Christmas shopping coming along? Feels like December is just flying by! Love all the sparklies in the swatching. So glad you swatched them because it really does look different than in the pretty box. New Year, New Clothes! Hello Abercromie & Fitch! Softbank commercials crack me up! Love Jiro!